Read more about all of our NYC picks in New York City: The Gluten-Free Guide, available now on Amazon. New York City can be heaven for gluten-free travelers. Hungry for crêpes? Or gourmet mac and cheese? Maybe bagels or waffles? Or perhaps an indulgent bakery or two? New York has you covered, even down to the monthly gluten-free pop-up market. But sometimes, as a traveler, you don’t have much time to explore your host city. Where do you stay when you simply need a comfortable hotel that can accommodate your gluten-free needs? The Grand Hyatt New York is well located in midtown Manhattan, practically next door to Grand Central Station. A large hotel, with over 1300 rooms, the Grand Hyatt still manages to offer personalized service. Both the hotel’s social media manager and the registration staff quickly confirmed that the hotel’s lounge, the Grand Club, would be able to provide gluten-free breakfast options during a recent stay. Upon arrival, the Club’s attendant offered a personal tour of the buffet and discussed gluten-free foods available on request. 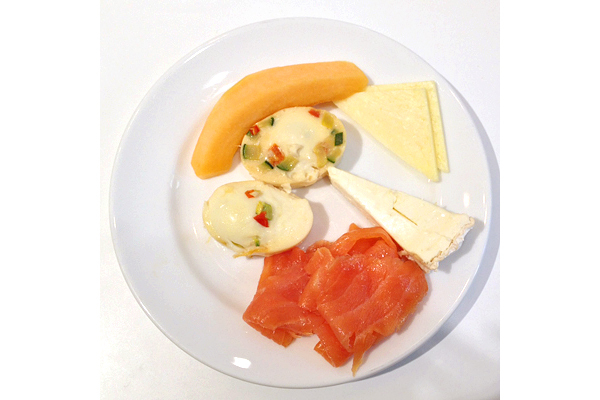 The Grand Club’s breakfast buffet offers plenty of healthy options, including yogurt, eggs, fruit, smoked salmon, and a selection of cheese. Don’t hesitate to fill up on the naturally gluten-free breakfast offerings! 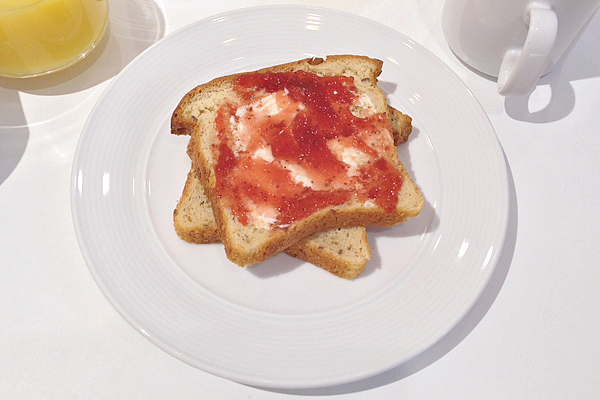 GF toast, made in a designated toaster, is also available upon request, along with your choice of jam. Don’t let this modest serving deter you—you can ask for as many slices as you like. The Grand Club also offers light snacks throughout the day and more substantial snacks in the evening. The Club’s gluten-free afternoon and evening options seem far less reliable than its breakfast offerings, so plan to eat your other meals out at one of New York City’s dozens of gluten-free friendly spots! Many Manhattan Hyatts offer impressive gluten-free breakfast options. The Hyatt Times Square, the brand’s newest, serves breakfast at its first floor restaurant, the T45 Midtown Diner. The diner has several gluten-free options available; be sure to ask servers about ingredients before ordering. The Andaz Wall Street serves brunch in its intimate second floor restaurant, Wall & Water. The Bloody Marys are fantastic, and so are the knowledgeable servers, who can walk you through the gluten-free options on the menu. The Hyatt 48 Lex, a favorite for its boutique feel, serves brunch in its first floor restaurant, Lexington Brass. 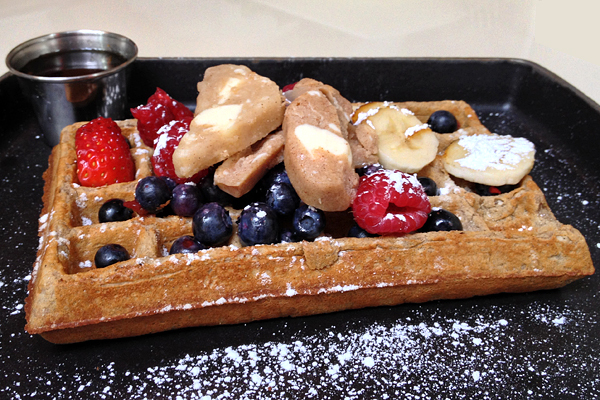 Don’t miss the gluten-free waffles! 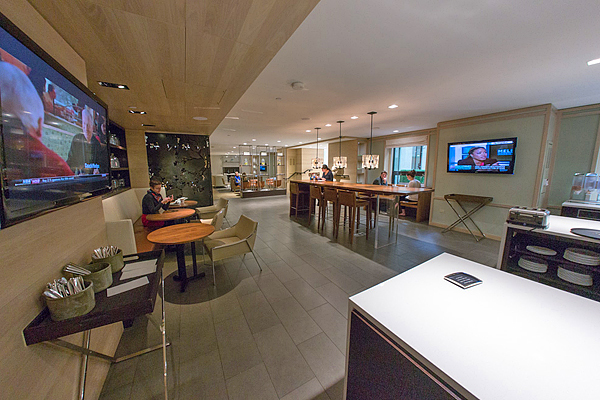 For additional ideas for maximizing hotel lounges for gluten-free traveling, click here. Where? The Grand Hyatt New York is located in Manhattan, near Grand Central Station: 109 East 42nd Street, New York, NY (212-883-1234).